Taking care of your home requires regular maintenance. Keep on top of things with our printable home maintenance checklist, handily set out according to the seasons. This may not be an exhaustive list of everything you need to do in your home. After all, everyone’s home is different and the to-do list for a new build apartment will be very different to that of a listed building. But, we all have two things in common: our home is our castle and one of our biggest investments. So here are some key things to do to take care of it. The tasks are divided by the season in which it makes most sense to tackle them. Check everything off and you should avoid unexpected costs from calling in the professionals later down the line. Check the roof for any damage sustained over winter and moss growth. Fit bird cages to any chimney pots so that birds can’t nest in them. Check your chimney stack, using binoculars if needed, to see if it needs repointing or the pot is loose. You’ll know if it needs repointing because there’ll be areas of grouting missing or possibly plants growing in gaps. Inspect and, if needed, clean guttering and drainage holes. Get up on a ladder and scoop out leaves, moss and anything else that’s hiding there. This is important so gutters can effectively take water away from your house and not sit against walls potentially causing damp and damage. If you have air bricks make sure they are clean and clear. These bricks allow air to circulate under the floors of buildings that have a suspended timber floor. If they get blocked you risk damp. Clean windows inside and out, because as the sun starts to show so will the state of your windows. Check window frames for damage or rot at the same time. A patch repair will be cheaper than leaving them to rot. Check your exterior paintwork and patch up flaking areas. You may want to look to arrange any decorating works for the summer. Stretch your muscles and shift your sofas and other furniture. Clean underneath and behind them. While it is away from walls check for damp. Check your loft for any signs that water got in over winter and everything is as it should be. While you are up there measure your insulation. It should be at least 270mm deep. Top it up if needed. Turn down your thermostat as the temperatures start to rise. For more tips on cutting your energy bills read our guide to getting your heating working for you. As the weather warms up it’s time to head firmly outdoors with your home maintenance checklist. Clean patios and jetwash decking at the start of summer to prevent them getting slippery. Repair and paint any external woodwork including fencing, fascias, window frames and doors. Repointing is best done in the warmer, drier summer months. Prune any large trees or shrubs that are close to your home in order to reduce their water consumption which can contribute to subsidence. Trim any climbing plants and don’t let them grow across windows or guttering. Wash your duvets, pillows and curtains. Take a look at the seals around your baths and sinks to make sure there aren’t leaks. Where sealant is discoloured it may be showing signs of wear which could lead to a leak. Prevent this by re-doing it yourself or finding a handyman to do it for you. As summer draws to a close shop around to make sure you are still getting the best price for your gas and electricity. Get your home maintenance checklist ready and winter-proof your home. Bleed radiators so they work effectively in heating your home. Clean and store away your garden furniture. 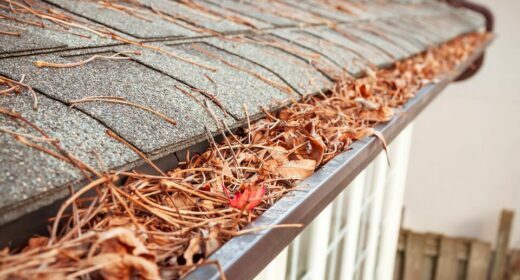 Once the leaves have dropped, clear your gutters and drainage holes. At the same time make sure all pipes are securely fixed to walls. Clear leaves and debris that has gathered around your external walls to prevent any risk of damp. Make sure there is at least 150mm clearance between your damp proof course and the ground. Insulate any external pipes or taps to prevent them freezing and bursting over winter. As the nights draw in make sure any security lights are working and outbuildings and sheds are locked. Get more tips with our guide to making your home secure. Review your home insurance. Have you got enough cover for your possessions? Make a note of when it renews and shop around for the best deal. Follow our home maintenance checklist to keep your property safe from the winter weather. Check your fences and trees for storm damage regularly. Undertake repairs quickly to prevent a fall causing further problems. Take a look at your roof – from across the street or the bottom of the garden – for slipped tiles after windy weather. Clean leaves and debris from the garden and trim trees to avoid loose or dead branches coming down in strong winds. Prevent damp by opening windows occasionally and using extractor fans. If you get condensation wipe it off wooden window frames to prevent rot. Check your pipes for leaks after particularly cold weather. Dig out your mortgage paperwork. Has your initial deal ended? Make a note in your calendar or diary to start shopping around for the best remortgage deal at least a month before your current deal ends. Tether down any large garden items in case of storms. Trampolines have been thrown huge distances by strong winds leading to plenty of amusing tweets. But, they can also land in incredibly dangerous positions. Storm Eleanor left two on a railway line in Buckinghamshire. You can buy tethers for trampolines and other furniture online. How can I tell when my roof needs replacing? Maintaining garden walls and fences, who pays?